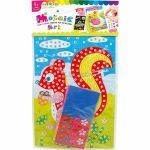 EVA foams are excellent, flexible and colourful crafting material - they make great 3D projects! Copyright (c) CK Creatives 2011-2019. All rights reserved. Do not copy, publish or distribute without prior consent and permission.